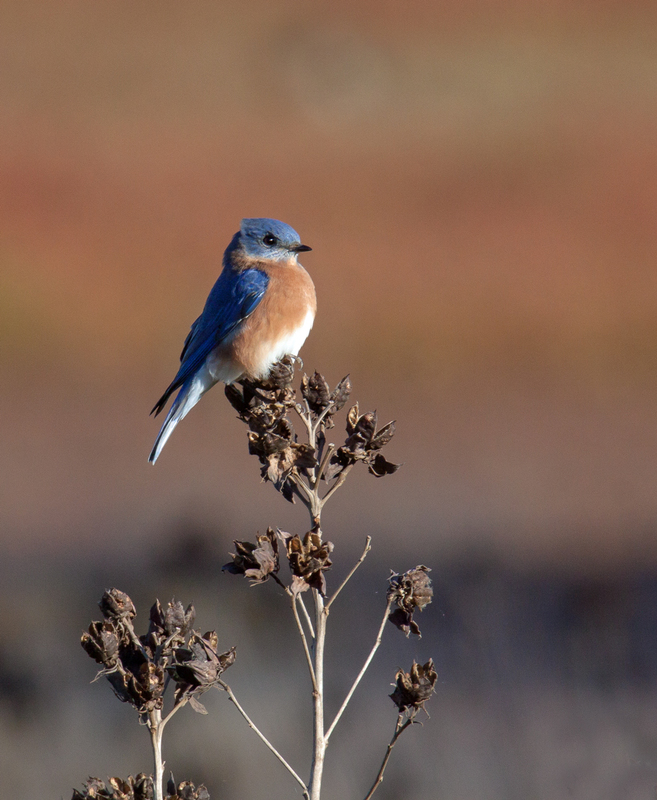 Early morning light and fall foliage make such a great backdrop and I was thrilled when an Eastern Bluebird (Sialia sialis) flew closer to me and allowed me to take advantage of the situation. I love it when the composition is this basic and the results are simply beautiful. It’s not really called a Halloween Butterfly—I sometimes like to make up my own names for the creatures that I see and photograph. It was a cool, but sunny day when I came upon the butterfly, which was completely stretched out, basking in the warmth of the sun’s rays. I wasn’t sure it was alive, until it flew away when I moved in a little closer after some initial shots. The unusual wing shape made me think it was either an Eastern Comma or a Question Mark butterfly—yes, there are butterflies named after punctuation marks—but I wasn’t sure which one. After a little research on line, I’m convinced that it is probably an Eastern Comma butterfly (Polygonia comma). 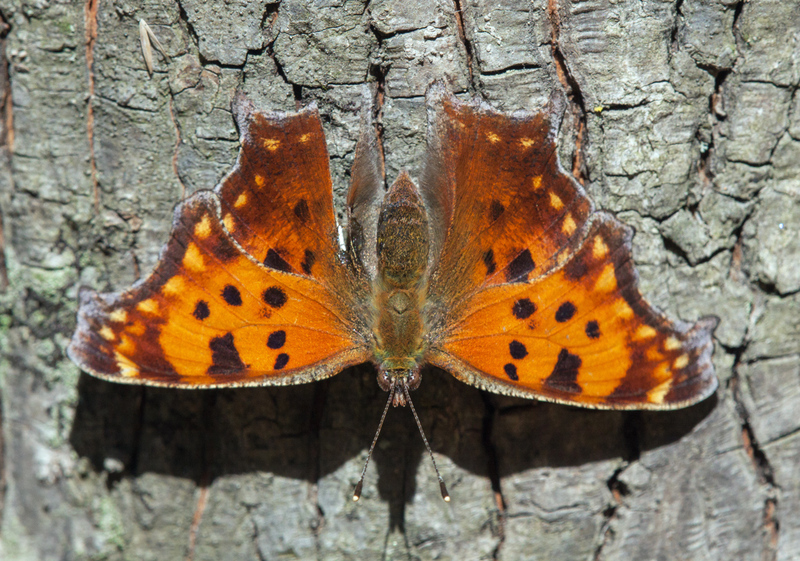 According to a posting on Trekohio.com, Eastern Comma butterflies have three dark spots in a row on their front wings, while Question Mark butterflies have four spots. In spring, the un-dead arise again. 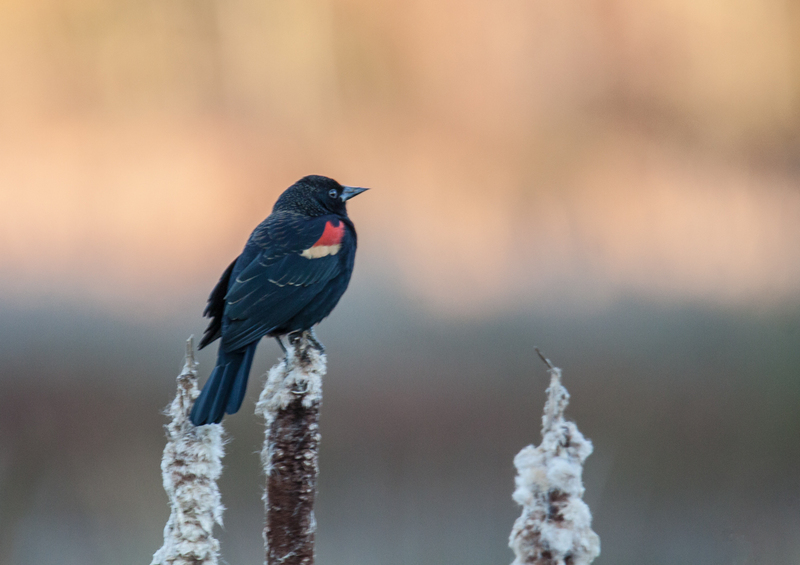 The soft morning light reflected off of the colorful autumn foliage early today at Huntley Meadows Park, providing a beautiful backdrop for this male Red-winged Blackbird (Agelaius phoeniceus) as it perched in the cattails. 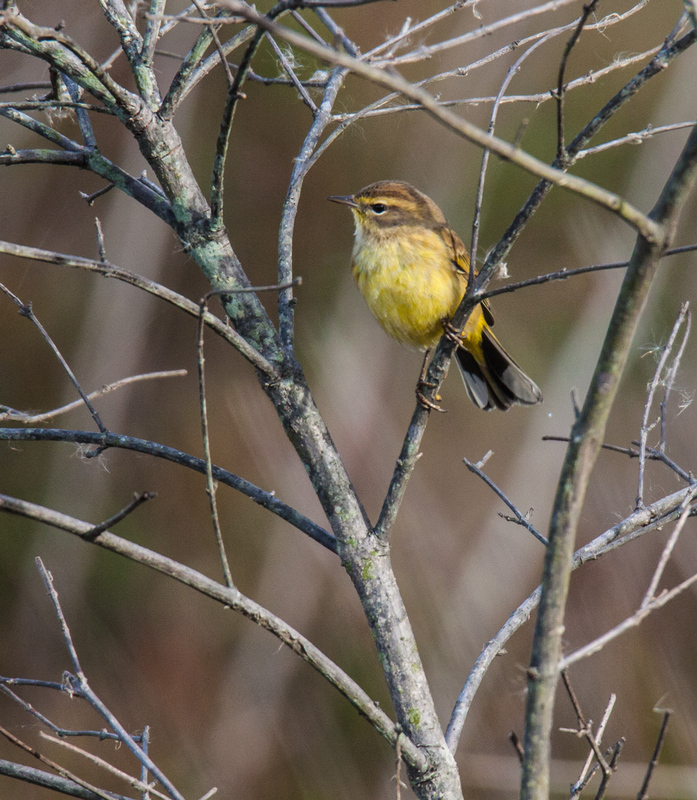 Warblers are so small and hide so well in the trees that I almost never see any. 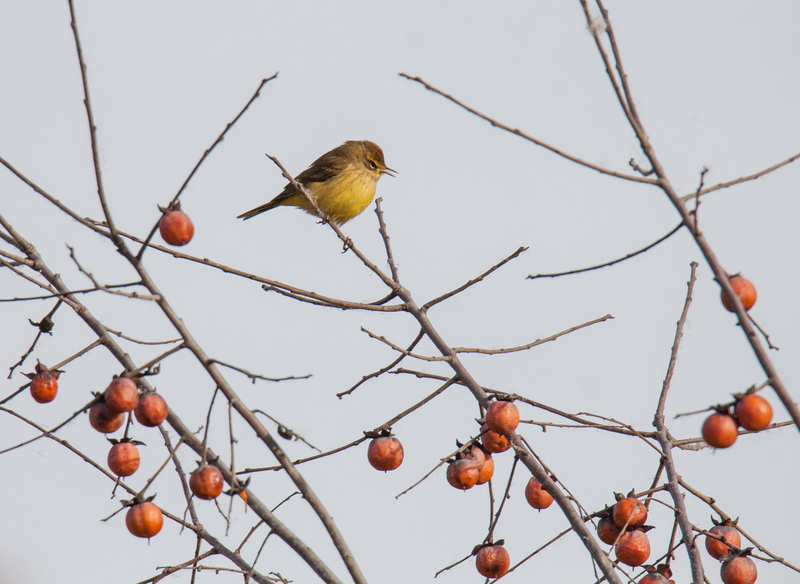 This past week, however, I spotted a flash of yellow in the distance and I was able to capture some shots of what I have been told is a Palm Warbler (Setophaga palmarum), though it is hard for me to confirm the identification, considering how much many warbler species look almost alike. 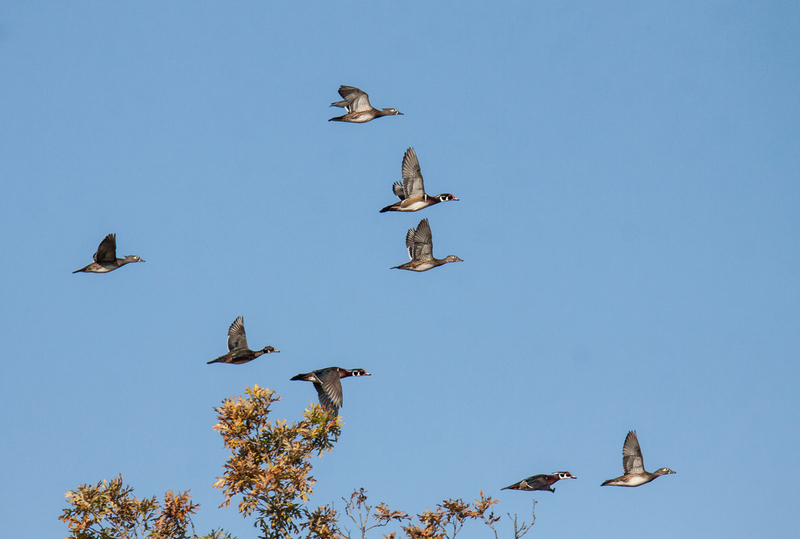 I took these three shots from the same spot on the boardwalk at my local marshland park as I looked across a field of cattail and other vegetation. 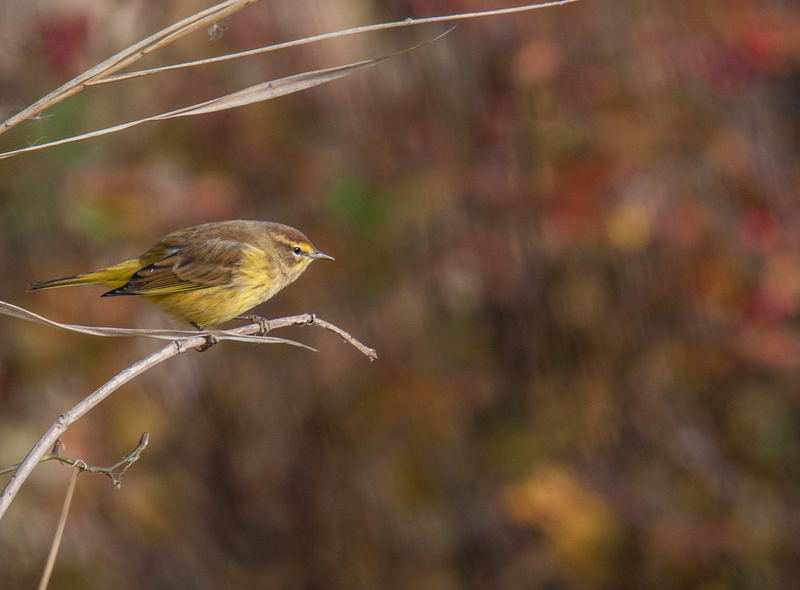 It’s interesting to note how much the feel of the photos changed as the warbler moved from perch to perch. Normally I try to get close-up shots of my subjects, but I decided not to crop in on the first image, which reminds me of a Japanese ink painting with its sparse use of color and emphasis on lines and shapes. 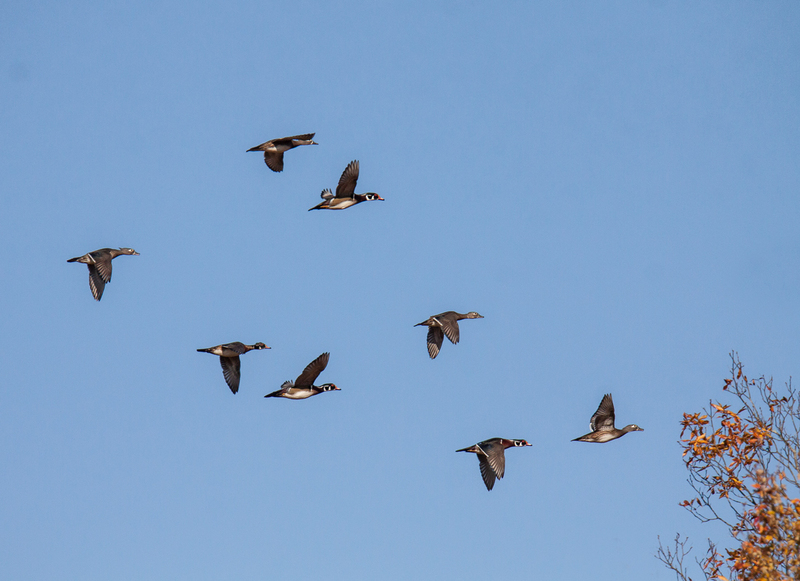 The background was so interesting in the second image, that once again I did only a minor crop. In the third image, my favorite element is the warbler’s tail. 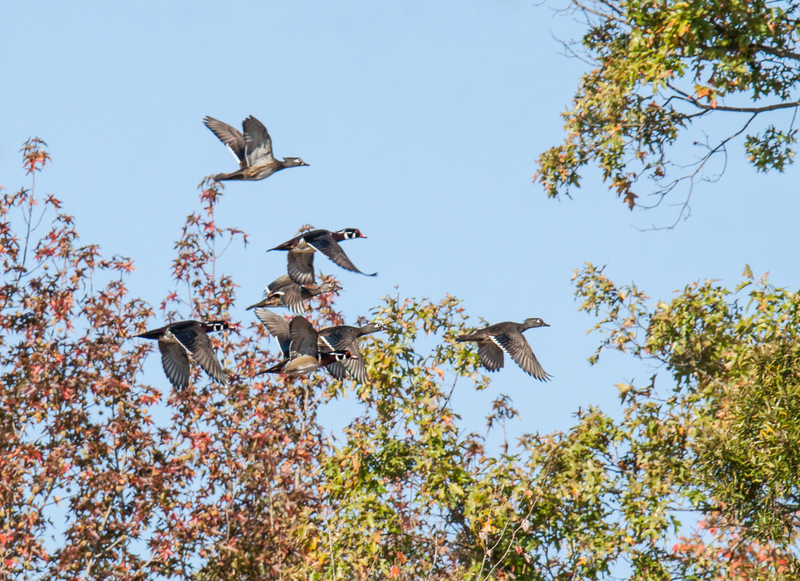 This past weekend I inadvertently spooked a small flock of little Wood Ducks (Aix sponsa) while wandering about Huntley Meadows Park, but managed to get some shots of them as they flew away through the trees. 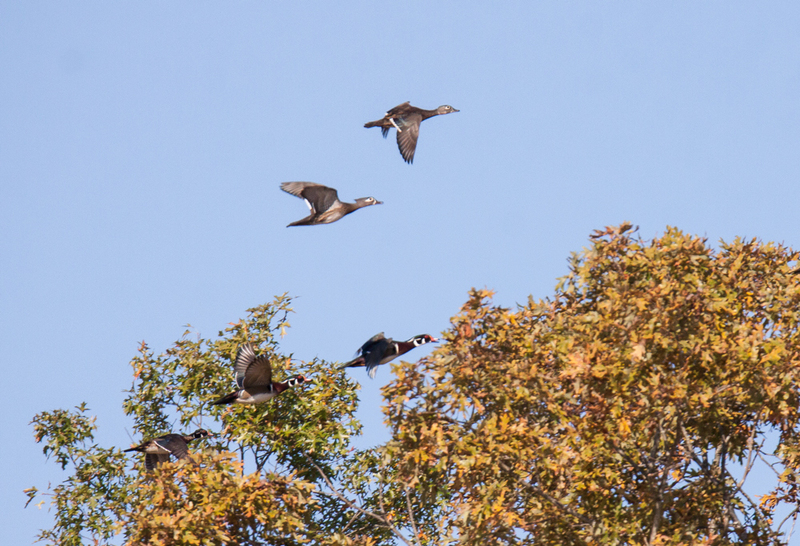 I just love the combination of the colorful birds in flight and the autumn foliage. 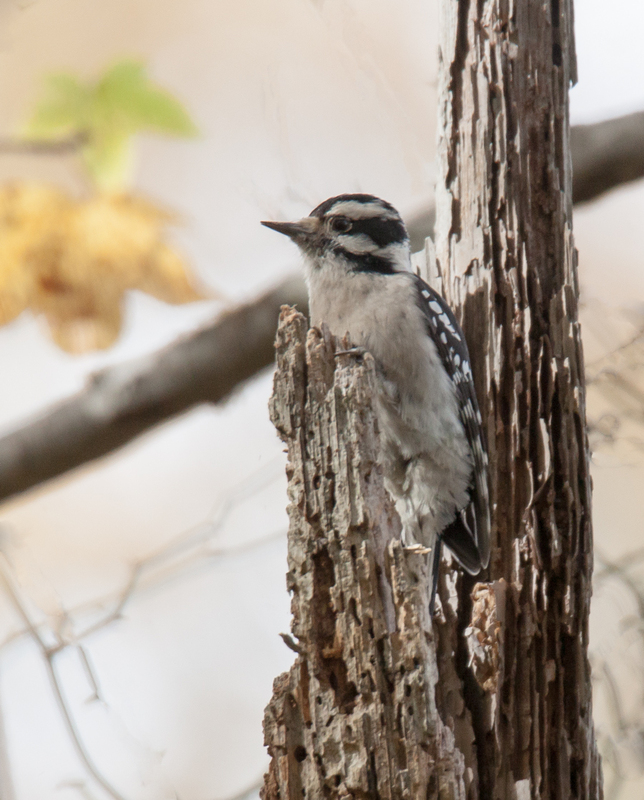 After a gray, rainy day like today, I need a visual pick-me-up and energetic Downy Woodpeckers (Picoides pubescens) never fail to raise my spirits. I spotted this little beauty at Huntley Meadows Park this past weekend. 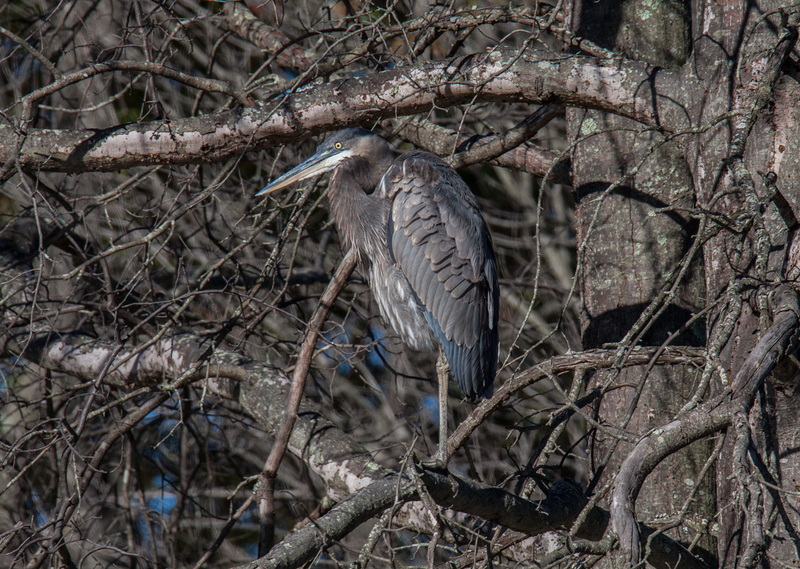 A Great Blue Heron (Ardea herodias) is so big that it’s difficult to imagine one hiding itself effectively. Yet when this heron settled in among the branches of a tree, I was amazed to see how well it blended in with its surroundings. The heron was so effectively camouflaged that others who walked by did not even notice this large bird until I pointed it out to them and some of them still had difficulty picking it out.